Uber and Ola might not be making any money at the moment, but their competitors aren’t doing any better. Uber-Ola competitor UTOO Cabs has suspended its operations in Hyderabad and Bangalore. “Our services are currently suspended. 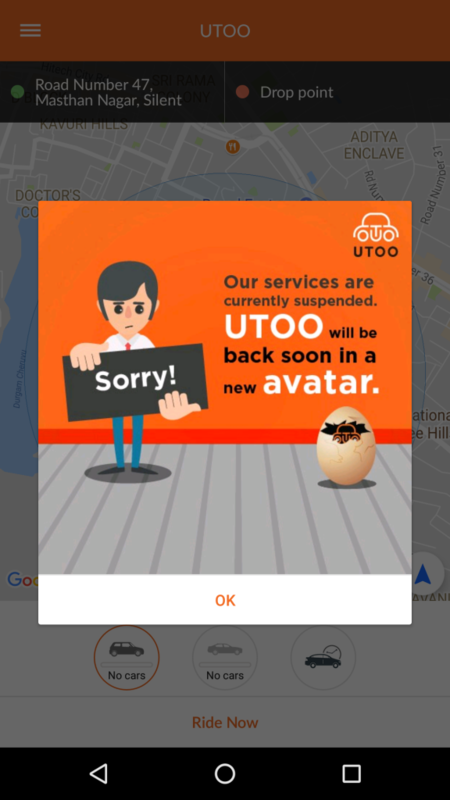 UTOO will be back soon in a new avatar,” says a message on its app. The company appears to be still running its operations in Chennai. Chennai-based UTOO had been launched in June last year to take on Uber and Ola, and had expanded to Hyderabad and Bangalore soon after. Its strategy, though, had differed from its bigger rivals. While Uber and Ola engaged themselves in a brutal price war, UTOO had decided to instead focus on service– it had positioned itself as a premium cab service which provided “courteous drivers” in uniform. UTOO had also decided to simplify pricing structures by doing away with surge prices. Most crucially, UTOO had decided to focus on its drivers. Uber and Ola had seen driver unrest through strikes and protests, but UTOO had decided to woo its drivers with an ambitious scheme. The company had announced that all drivers would be offered apartments costing Rs. 15-25 lakh, which they could then pay off in installments using finance schemes. UTOO had purchased 200 flats in Perambur in Chennai, and was in the process of purchasing more. UTOO seemed to fix all the problems Uber and Ola were facing — customers would have better services, and its drivers would be happier. UTOO also had the might of an experienced entrepreneur behind it — it was founded by former Aircel owner C Sivasankaran, who’d pledged to put as much as Rs. 1,300 crore into the company. But UTOO’s struggles have only served to prove how hard Uber and Ola will be to dislodge. UTOO’s all-sedan fleet had been praised for its service standards, but customers had often complained about the lack of available cabs. Uber and Ola, on the other hand, had quickly got large fleets running, thanks to generous subsidies to users and heavy incentives for drivers. This meant that their cabs were pervasive, and wait times were low. Customers chose to pick an on demand service with lower wait times and cheaper fares, even if the service standards weren’t quite as high. UTOO, though, isn’t quite down and out. It still runs operations in Chennai, and its Hyderabad and Bangalore users have been told that it’ll be back in a new avatar. It’s unclear what the new avatar will be, but the app is already offering package deals for cars, allowing users to book them for a fixed number of hours. But its withdrawal from the cab-hailing business shows that Uber and Ola, in spite of their issues with both customers and drivers, are probably here to stay.